High-quality childcare programs have considerable long-term effects on such areas as school achievement, cognitive skills, language ability, math skills, grade retention, and social adjustment. Found that preschool attendance was connected to a person’s success in life 25 years later. Findings are interpreted as indicating that high-quality pre-Kindergarten programs can serve as effective early intervention programs for children with special needs. A quality prekindergarten experience can have long-term positive effects on children’s lives. Many of these benefits, including impacts on participants’ own health, decisions about marriage and family, and financial stability. Our infant, toddler, pre-school and kindergarten classrooms schedule includes time for indoor and outdoor play, snacks, lunch, hygiene and structured and unstructured play. 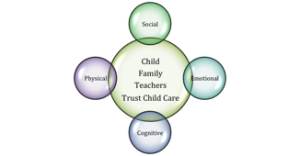 At Trust Child Care our Daycare Curriculum provides a balance of cognitive, physical and social-emotional. The early years are a critical time with regards to the emergence and development of the individuality, character and learning style of young children. Providing a safe daycare environment, nurturing and stimulating for children to grow, explore and have fun is paramount to their global development. The meals at Trust daycare are free of trans-fats, artificial coloring and artificial preservatives. When available, meats, dairy and produce used in the menus come from local Ontario farmers who are committed to supplying food that is raised without using sub-therapeutic antibiotics and growth promoting hormones. We provide many options for our parents to accomodate their busy day. If you live nearby and wish to walk or take the TTC to daycare we offer secure stroller parking inside the dayare. Our large parking lot allows for a convent pickup and drop off area. Our daycare provides a secured entry using Procare automated attendance, check-in and check-out using your unique personal ID. We have one of Toronto’s largest secure outdoor daycare playgrounds with over 3600 sq ft of space!